The Ionic Stratus Drone is a quadcopter that is sure to take you by surprise, all thanks to its countless features that it comes equipped with. This is one of the quadcopter drones that come equipped with a mount for your GoPro and is certified ASTM, EN71, and EN62115. It is also armed with a lot of cool in-flight features while being a medium-sized drone overall. The Ionic Stratus Quadcopter is probably one of the least expensive drones on the market which offer both casual fun and professional requirements. The design is extremely light and versatile and serves a multitude of purposes as you can add or remove as many elements as you want to. The GoPro mounting possibilities promise to deliver great mid-air photographs, with the extra stability that the drone provides (due to a versatile gyro based 6-axis system). 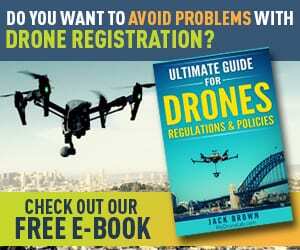 In addition to all of this, the drone has a multitude of other features, including, but not limited to a customizable throttle control, a headless mode, and more. All these make it extremely easy to control and navigate. Keep in mind: As this drone is really popular amongst people, by virtue of it being cheap and efficient, this is also the reason why there are so many copies of its accessories on the market. 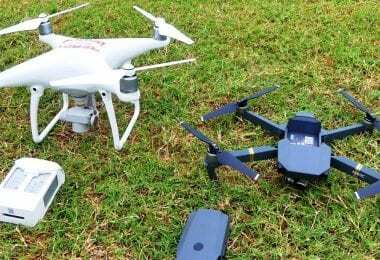 These copies are generally very flimsy and turn out to be a waste of money, and it is strongly suggested to use only original accessories with the drone for the best possible experience. 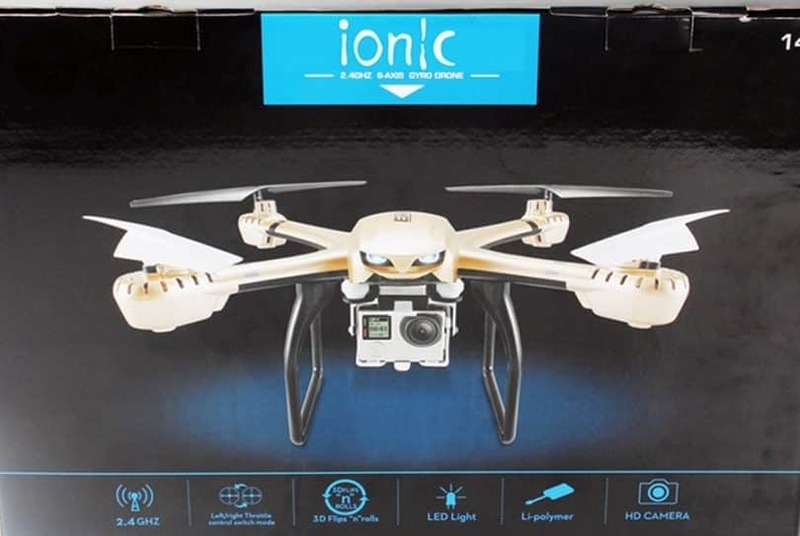 The frame of Ionic Stratus Drone is very sturdy and shock resistant and the remote control that is controlled by a microcomputer relies on 2.4G connection technology. 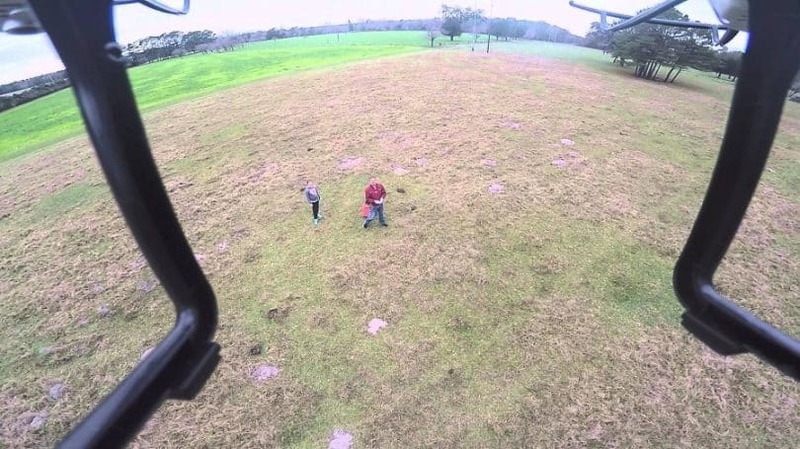 All you need to do for the drone to fly is to pair the remote control with the actual drone. 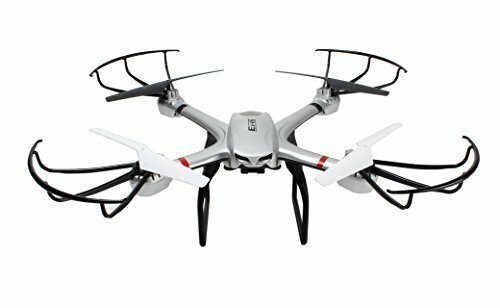 The Ionic Stratus Drone Quad comes with a 6-axis gyro that is compatible with a GoPro, an attachment for the Go Pro, headless mode, a cradle head to absorb shock(silver) and a one-key return. The frame is built out of materials that are really strong, which helps make the quad extremely resistant to all sorts of crashes and any other unpleasant events that might take place during a flight. The arms and the main frame plates are made to implement a higher level of strength. All in all, this drone also has the added benefits of looking cool and having really cheap replacement parts. One of the very few cons is the fact that the shock mount isn’t the best, which makes the GoPro unstable. This, and the fact that the parts are hard to find and take a long, long time to ship once you do find them. However, if you are here looking for a drone that is GoPro compatible, and maybe looking for more options, we suggest that you check out our article about GoPro drones and widen your possible choices. As mentioned above, the Ionic Stratus Drone comes with an attachment to hold a GoPro Hero camera. This is extremely handy and has enough space to attach any model of the Hero that you want. The Ionic Stratus is delivered with the mount that allows you to attach the camera to the front of the drone. As a result of this added accessory, you can take High-Definition photograph. As this is just a starter kit, the battery is just about enough for a flight time of about 10 minutes. The 7.4V 1200MAh Lithium battery takes a total of 150 minutes to charge from nothing up. The remote control for the drone runs on 3 x AA batteries. This quad does not come with an additional battery but we suggest you buy one as soon as possible so you can have a longer flying time, which translates to more fun. The Ionic Stratus Controller works on a 2.4G, GR-246 transmitter system, which, according to the reviews we have from users, has served them very well. The Remote Control needs 3 x AA batteries for power and works great up to a range of about 150 meters, which, for most beginners and medium level users proves to be more than just enough. Ionic Stratus Drone is very easy to work with even if you’re a user with minimal experience with quadcopters, which is why it proves to be one of the best ones to start your journey with. The controls are easy, and the extra pre-programmed maneuvers make the ride really fun. In flight, the multirotor stays really stable and is very easy to control once you learn all of its controls. It has a maximum range of 150 meters and can stay in flight for ten minutes. You can check the quad in motion above. The Ionic Stratus drone is a treasure at such a price. 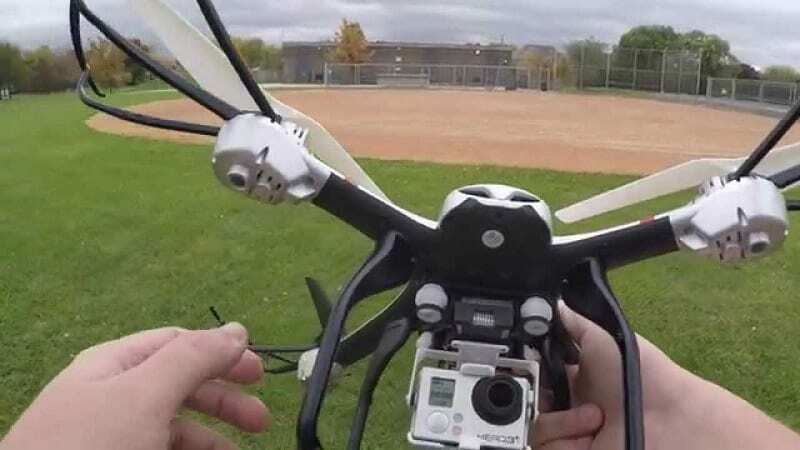 The drone is compatible with GoPro Hero Camera and you can attach the camera to it flawlessly. Not to forget, the camera is not included in the kit, and you would have to purchase it which can easily soar the price of the drone easily. Thus, it is highly recommended to go for these accessories only when you are in need. Further, you can also equip the drone with an extra set of batteries and enhance its flight time. But then again, an extra set of batteries is not included in the kit, and you would have to invest from your own pocket. In the case of any glitches and technical abnormalities, you can contact the seller and look for the guarantee and warranty policies of the manufacturer. The Ionic Stratus Drone is easily controlled, stable and very cheap for all the features that it provides you with. 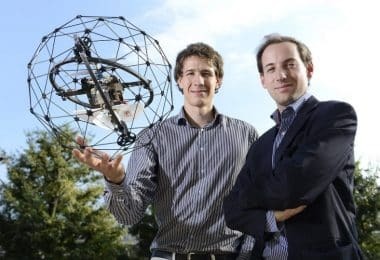 As an example, we have to mention that the drone boasts of a 6-axis gyro stability which lets it stay stable and responsive in mid-air, even while performing tricks (360 flips etc). As an added benefit, the drone comes fit with a really reliable landing gear that helps to cushion the landing and give it overall added stability while also keeping the attached camera safe during a hard landing. The landing gear has proved to be very effective as per our user reviews and the general testing that we put it through. The minor problems with the GoPro holder persist but aren’t anything to ruin the experience. In addition to all of these features, this drone also boasts of a number of features which make it highly responsive and very easy to control mid-flight. It also comes with a throttle control stick that allows the drone to move in various directions. The Remote Controller also lets the user select from three-speed settings for the perfect flying experience. Even more, Ionic Stratus Drone has a headless mode and a button for the 3D roll function for users who would like to see their drone perform some stunts whilst also recording using the GoPro camera. It has a one-key turn, which is fast becoming common with the newly manufactured drones. 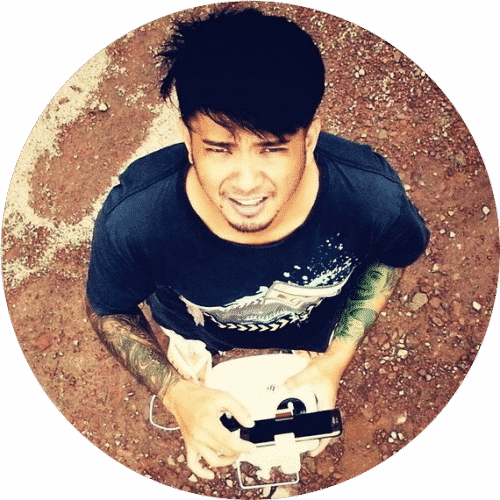 Headless Mode: this mode is useful, especially for beginners as it allows the drone to move in relation to the user’s position towards the drone. This makes it much, much easier to move the Stratus around in the exact you want. 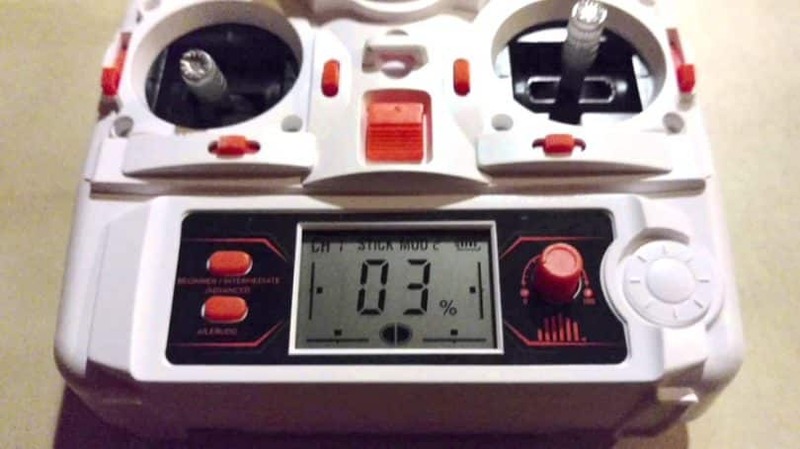 User reviews report that the Headless mode works like a breeze and offers improved control over the drones’ movements. One Key Roll Button: this function makes the quad roll forward once. 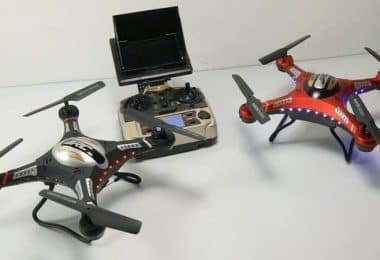 This operation has been pre-programmed in mostly to let the newbies slip in comfortably into the world of quad flying and to basically increase the fun. 3-D roll function: there is a total of 3 channels on the remote control: a Low-Speed Channel, a Medium Speed Channel, and a High-Speed At any of these channels, if the user presses the roll button on the top portion of the remote control, the quad will roll forward. It will also go backward by pressing the appropriate button. This roll action can be done through controlling the forward/backward control stick or the leftward/rightward flight control stick on the RC at higher speeds. Walkera runner is an RTF drone, and thus, you don’t need to boggle your mind the day you purchase it in assembling the part. However, minimal assembly is required in terms of camera, propellers, and battery to put the drone in place and make it fly. The drone comes with propellers, optional camera, and a battery pack. As compared to Ionic Stratus Quad, the Runner 250 comes with a more robust and funky set of propellers. 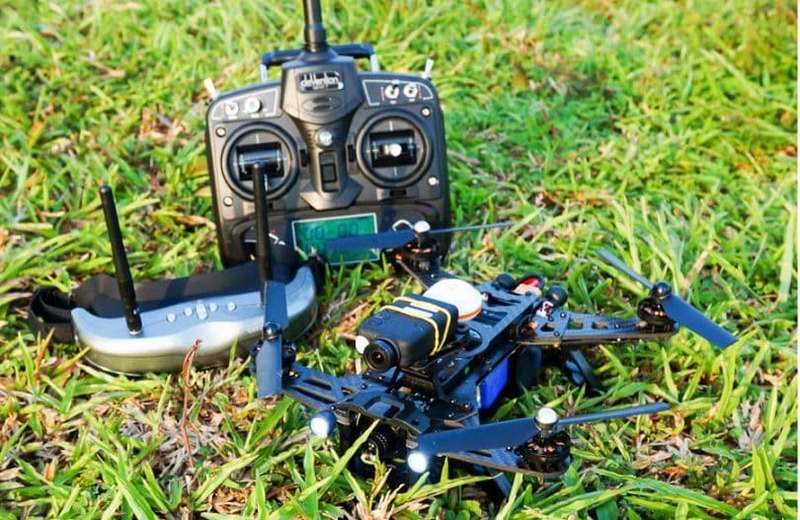 Walkera 250 flaunts a robust and strong frame and a unique controller (it comes with DEVO 7 transmitter) which makes the overall flying experience like a walk in the park. Walkera 250 is powered up by a carbon fiber structure which ensures durable performance. Unlike Ionic Stratus drone, Walkera 250 is fabricated making sure that the drone is sturdy and robust and so, it can handle brutal crashes and collisions. But owing to this property, this has made Walkera Runner 250 a bit heavy as compared to the Stratus drone. You can actually find out much more about this model by reading our Walkera Runner 250 in-depth review. This drone is similar to the Ionic Stratus in a lot of ways, but it stands unique when it comes to taillights and headlights which are often given a miss by drone manufacturers. These lights make sure that the drone is within your reach every time. Meeting speeds and heights is not a restriction for Racer 250, unlike Ionic Stratus drone. 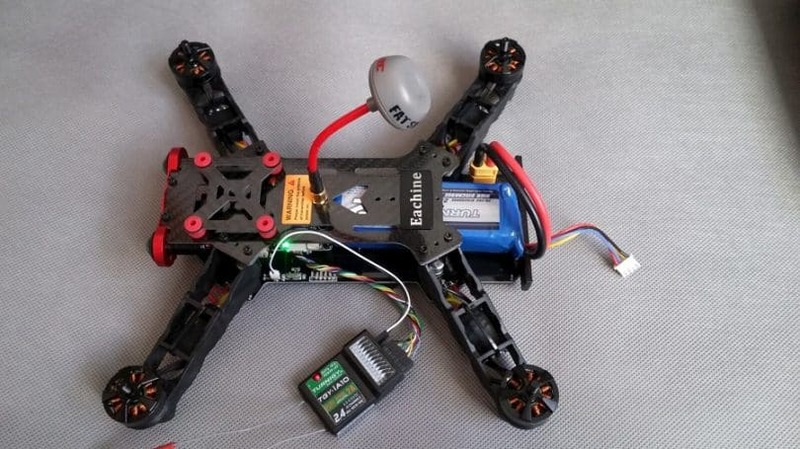 Eachine Racer 250 has a lighter body, somewhat similar to the Ionic Stratus drone, and thus one needs to be careful while flying and make sure that the drone won’t get damaged. Besides that, when compared to the Ionic stratus drone, Racer 250 is a racer drone and is capable of reaching heights and distances much faster, provided that you are a master in flying. And if you are a master, and would like to research this model more, then check out our Eachine 250 Racer review. DJI phantom 2 is a tough competitor for the Ionic Stratus Quad. Equip the drone with GoPro Hero camera, and you are ready to conquer the world by clicking cool shots while your drone flies. The drone comes integrated with GPS return to home functionality, thus making sure that you don’t lose track. 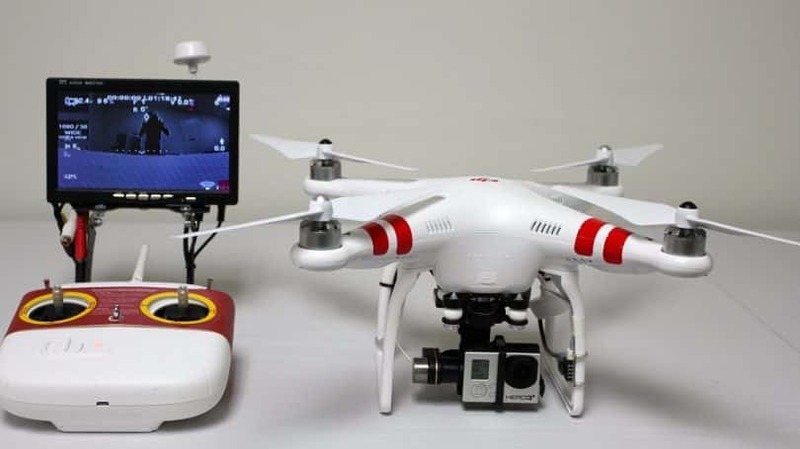 DJI phantom 2 provides a flight time of 20-25 minutes when charged fully, but the gimbal is not included in the package and you might need to install it. If you want to find out much more about this legendary model, we suggest checking out our DJI Phantom 2 review. While the Ionic Stratus drone flaunts a headless mode wherein you don’t need to bother the orientation of the drone while flying, Phantom 2 boasts of its GPS and attitude flight modes. To sum up, Phantom 2 is, of course, better than Ionic stratus drone but then if the price is your limitation, Ionic stratus drone is definitely a must go! After listing its main characteristics now, let’s see some pros and cons. The quadcopter is compatible with a headless mode such that orientation of the quadcopter is no more an issue. The mount for the GoPro isn’t of the best quality and, because it’s not stable enough, has been reported to offer shaky footage. The amount of time it takes the battery to charge seems way too long, and the amount of flying time it gives us is nowhere close to enough. The only way to get around this is to get an extra battery, and while that isn’t going to cost anybody much extra, it will still take a lot of time to deliver, considering the low availability to spare parts for this drone. The speed may be way too high for a new user to control. This is why you need to make sure that you handle it slowly during first flights. What new users also need to be wary of is the “flip” button on the front of the remote control. Pushing it while the drone is hovering inside the house could result in an accident. That all being said, the Ionic Stratus Quad would won’t disappoint you! With its wide range of amazing features, it is surely going to meet your expectations. To sum up, the Ionic Stratus comes with many practical accessories which include protection frames, landing skids, and also rotating blades so that the user doesn’t have to spend extra. In our opinion, this is a perfect drone that is sure to provide you robust performance. 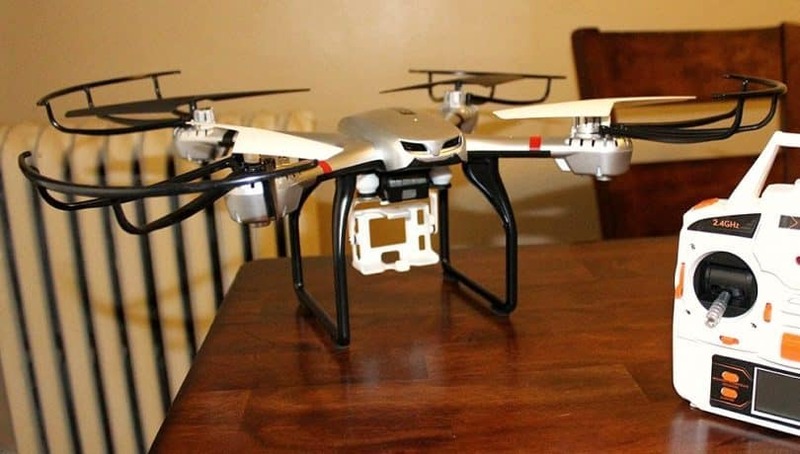 Did you get your hands on the quadcopter yet? Do let us know your opinion and your experience until now in comments!